If you’re seeing this error while trying to get to your WordPress site, don’t worry, this is fairly easy to fix. Check out the recommendations below on how to get connected again. This can also work for other browsers, such as Firefox, Edge, etc. When a user enters a URL in their web browser, DNS gets to work to connect that URL to the IP address of the actual server. This is called DNS name resolution and involves a DNS recursor querying various nameservers to figure out the actual IP address of a server. 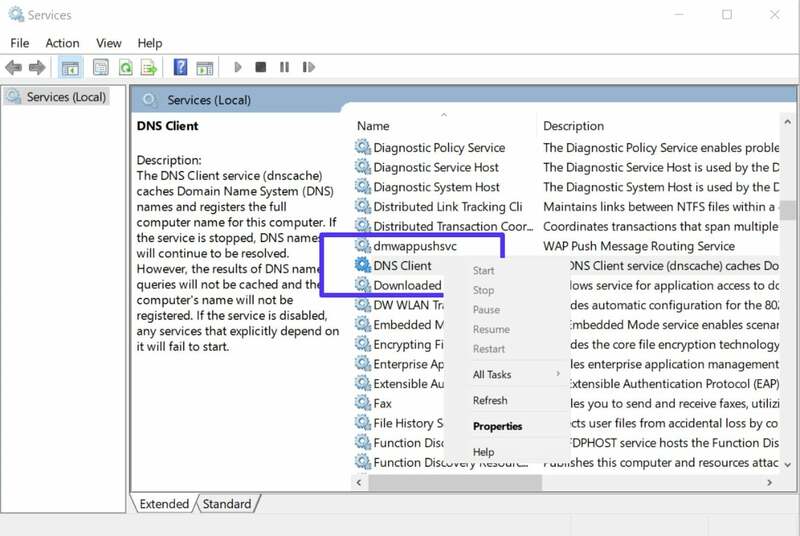 If DNS fails to resolve the domain name or address then you might receive the DNS_PROBE_FINISHED_NXDOMAIN error. The NXDOMAIN part stand stands for Non-Existent Domain. Read more about DNS and how it works. There are a couple different variations of this error depending upon the browser you’re running. In Google Chrome this error will show as DNS_PROBE_FINISHED_NXDOMAIN (as seen below) and will say that the DNS address could not be found. This site can’t be reached or This webpage is not available. In Mozilla Firefox it will simply show as Hmm. We’re having trouble finding that site (as seen below). 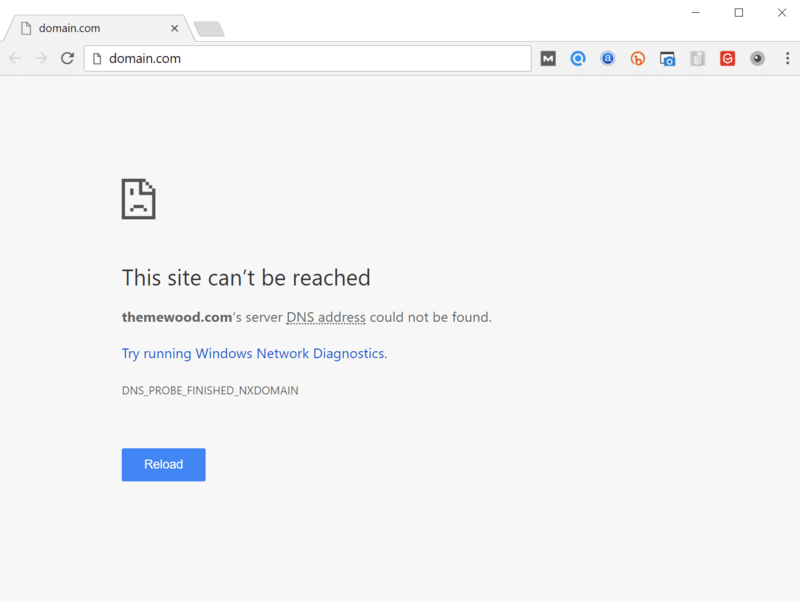 We can’t connect to the server at domain.com. 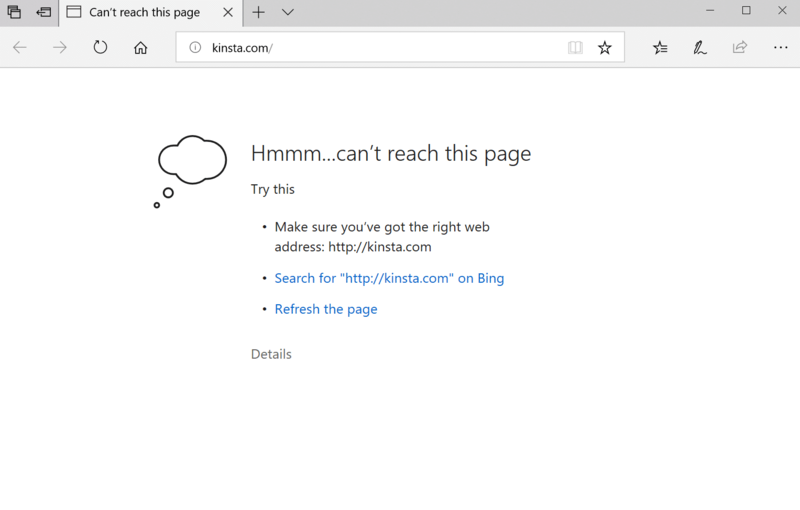 In Microsoft Edge, it will simply show as Hmmm… can’t reach this page (as seen below). Which isn’t very helpful. Make sure you’ve got the right web address: domain.com. 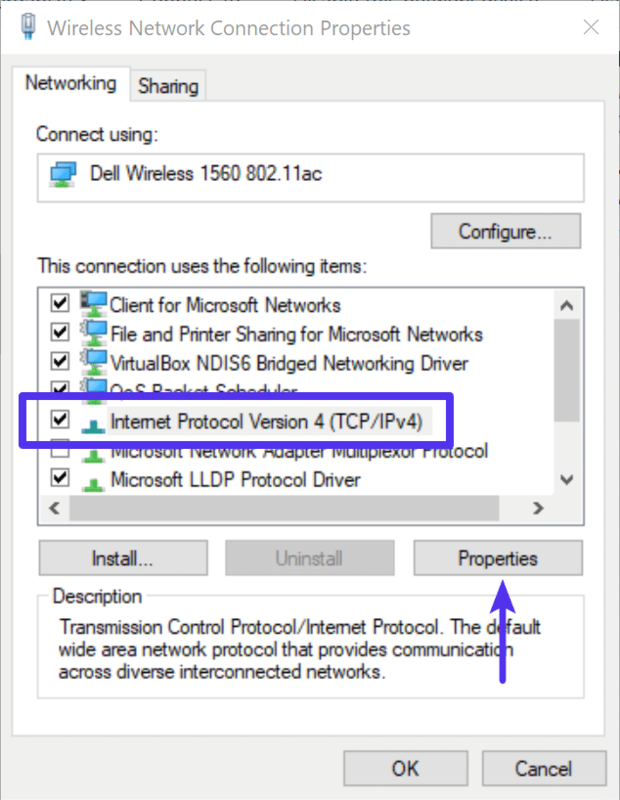 Due to the fact that this is usually a client-side DNS issue, the very first thing you should do is try releasing and renewing the IP address on your computer. This also includes flushing your local DNS cache, which is similar to browser cache. In Windows simply open up Command Prompt by pressing the Windows logo key and R. Then type “cmd” and hit Enter. Type in ipconfig /release and hit Enter. This will release your current IP address. Then type in ipconfig /flushdns and hit Enter. This will flush your local DNS cache. You should see a “Successfully flushed the DNS resolver Cache” if it worked. Then type in ipconfig /renew and hit Enter. This will renew your IP address. You might also try resetting your IP settings and Winsock catalog with the following commands: netsh int ip set dns and netsh winsock reset. 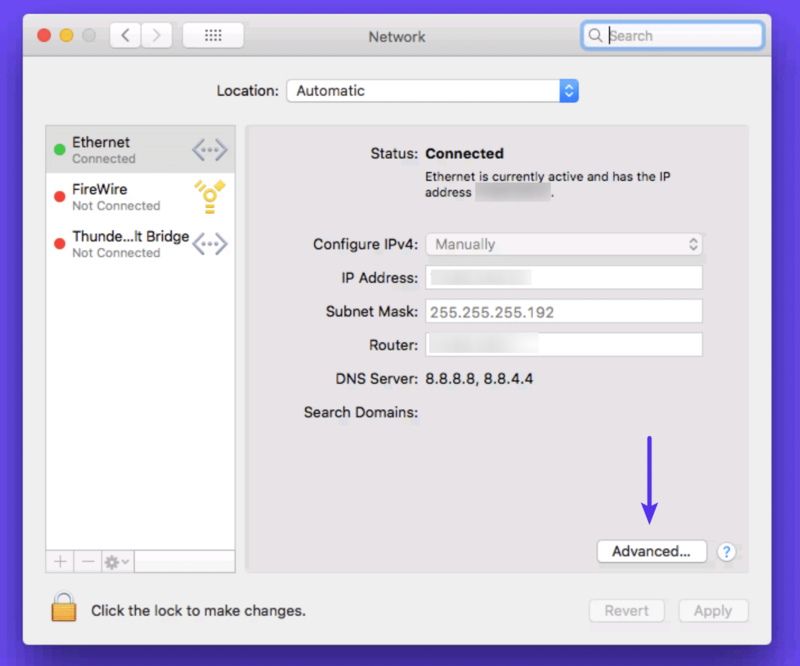 An alternative way to flush and renew your DNS is simply by disabling your network adapter and re-enabling it. Click the TCP/IP tab heading if you aren’t already in there. Then click on the “Renew DHCP” lease button. If you’re running Windows you can try restarting the DNS client services which resolves and caches DNS domain names. 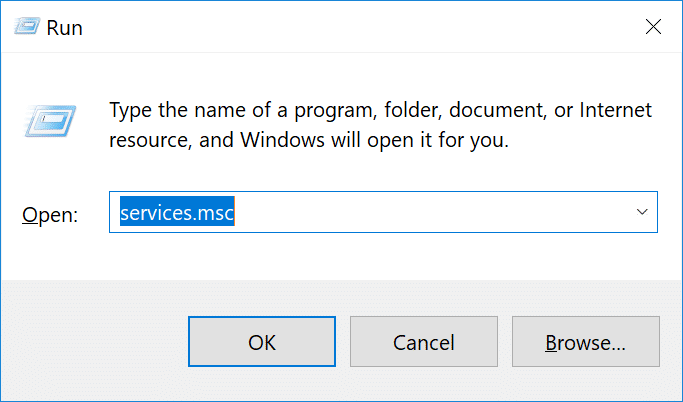 Simply open up Command Prompt by pressing the Windows logo key and R. Then type “services.msc” and hit Enter. If the restart option is greyed out for you (as it was for us), an alternative way to do it is via the command prompt. 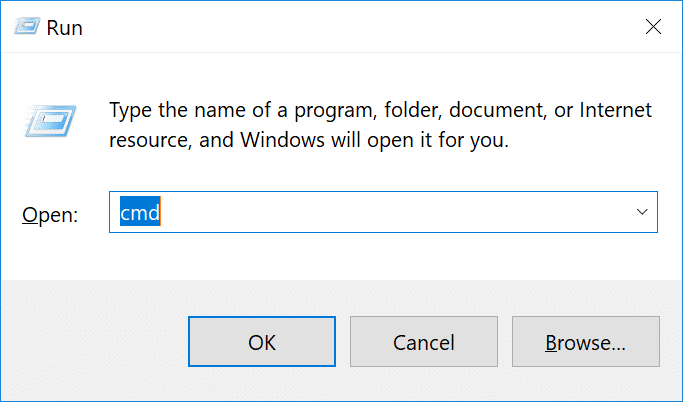 Open up Command Prompt by pressing the Windows logo key and R. Then type “cmd” and hit Enter. The requested pause, continue, or stop is not valid for this service. This is most likely because you need to run CMD as a network service to issue the command. If you’re running into this error, we suggest trying the other alternatives below first. The next thing you can try is changing your DNS servers. 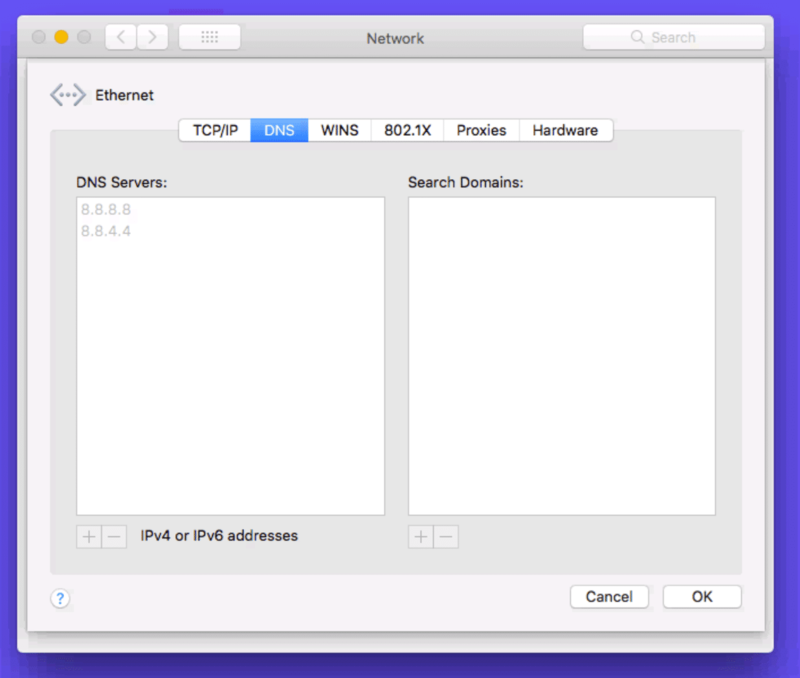 By default, DNS servers are automatically assigned by your ISP. But you could try temporarily changing these to a public DNS server, such as Google or Cloudflare. Some prefer to use Google’s public DNS (8.8.8.8 and 8.8.4.4) long-term due to them sometimes being more reliable. Cloudflare also just launched their new secure and blazing fast free DNS (1.1.1.1 and 1.0.0.1) which we will be using in this example. If you want to use Google’s the steps are the same, you simply replace the DNS server addresses with Googles. Tip: If you’re already using a free DNS server and having issues, removing it and defaulting back to your ISP’s DNS servers also sometimes fix things. 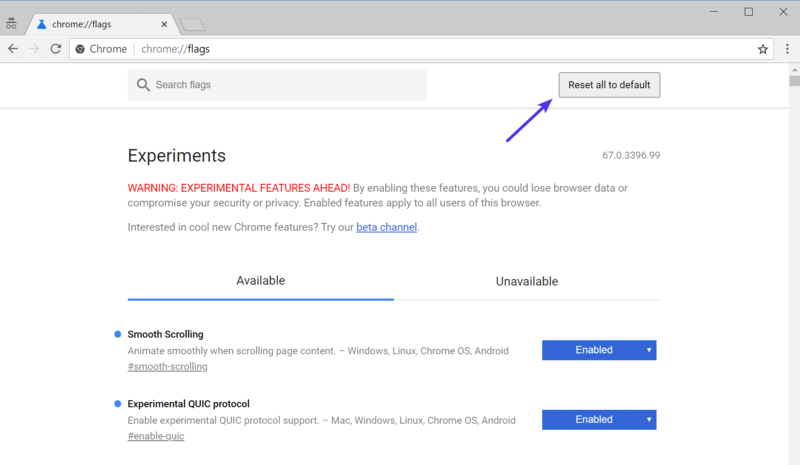 Google and Cloudflare aren’t perfect 100% of the time and there have been a few instances where we’ve noticed switching back has resolved the issue. In Windows simply open up Command Prompt by pressing the Windows logo key and R. Then type “control panel” and hit Enter. Click OK, then Close. Restart your browser. Click on the “DNS” tab. Then add Cloudflare’s DNS server addresses. Sometimes VPNs and Antivirus software can conflict or override your network settings, including your DNS servers, etc. If you have any running, try temporarily disabling them (closing them) to see if it resolves the DNS_PROBE_FINISHED_NXDOMAIN error in Chrome. Every computer has what they call a local hosts file. This is a file that contains manual DNS entries which are mapped to specific IP addresses. Typically this is only edited when you want to preview your DNS before switching over domains to a new host. However, there is a multitude of different ways this file could have been changed or edited. Therefore, if none of the above options worked for you, it’s worth double checking your local hosts file to ensure the website you’re trying to access isn’t in there. The hosts file typically requires additional access. So the first step is to open up your text editor as an administrator. 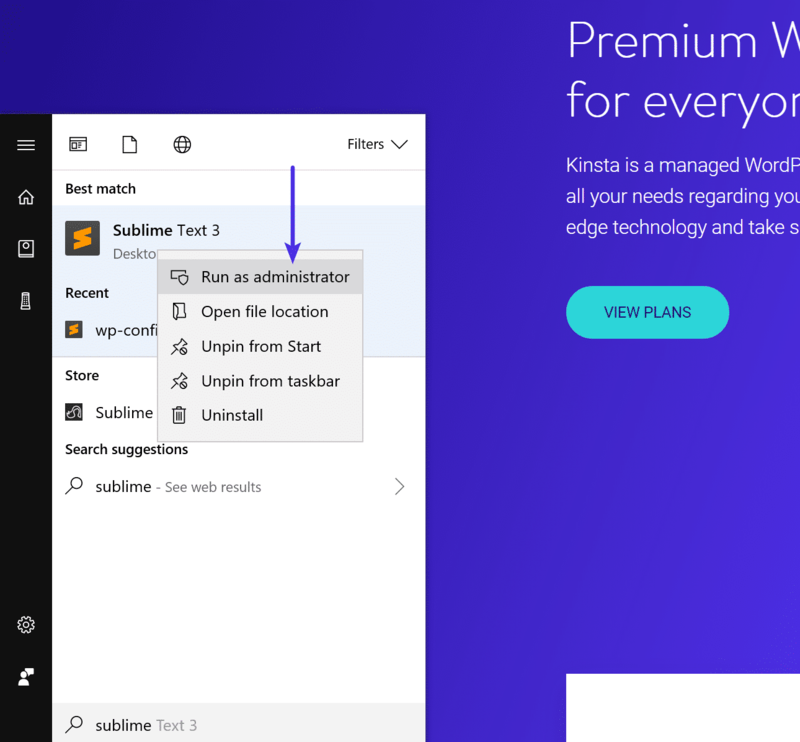 Simply click on your start menu, search for your text editor, right-click on it and select “Run as administrator.” This can be done in any text editor such as Notepad, Notepad++, Atom, etc. We are using Sublime in our example below. Double check and make sure the website you’re trying to visit isn’t listed in there. If it is, remove it. 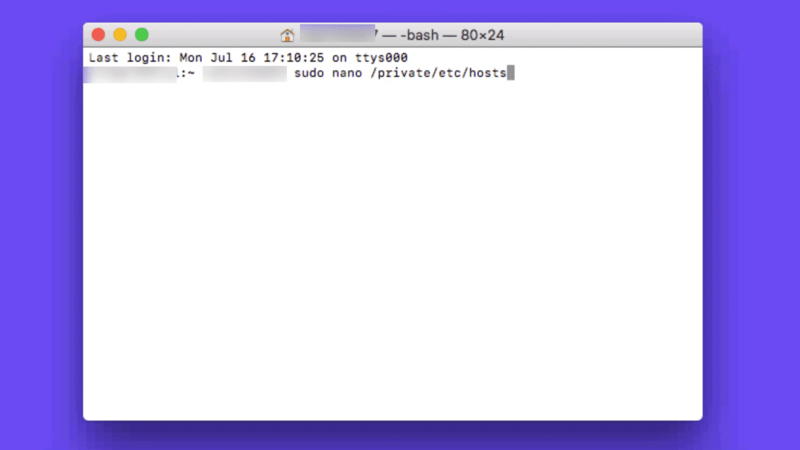 To check your hosts file on a Mac, we recommend getting Gas Mask. It’s a free application which can be used as hosts file manager, hosts files editor, and switch between them. It makes everything quick and easy! 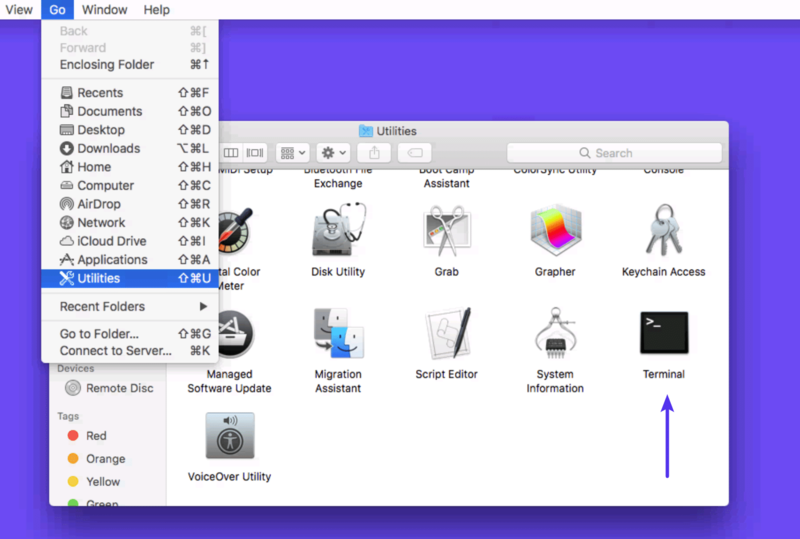 Otherwise, you can follow the steps below to edit your hosts file on Mac manually. Enter in the following command and press Enter (you will most likely be prompted for your administrator password as well). Double check and make sure the website you’re trying to visit isn’t listed in your hosts file. If it is, remove it. 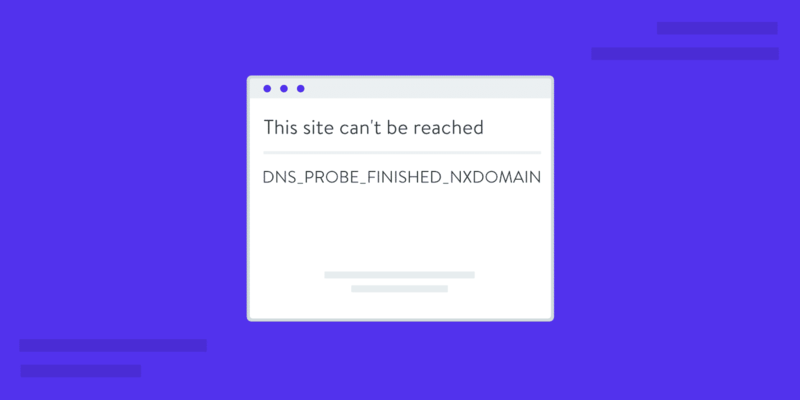 If you’re only getting the DNS_PROBE_FINISHED_NXDOMAIN error on a single domain, even after checking your hosts file, you might need to check the DNS settings on the domain name itself. If you’re a Kinsta client we have an in-depth post on how to point your domain and or DNS to Kinsta. If you recently migrated your website to a new hosting provider, it could be the DNS was cached incorrectly on your computer. In which case, Step 2 above should have resolved that. We know it’s annoying, but it has to be mentioned. 😬 If none of the above options work, trying restarting your computer and even your router. We realize many of you probably have hundreds of tabs or applications open and that’s why we made this the last option. But rebooting devices actually clears out a lot of temporary cache. Even though it’s frustrating, the DNS_PROBE_FINISHED_NXDOMAIN error is usually pretty easy to get resolved. 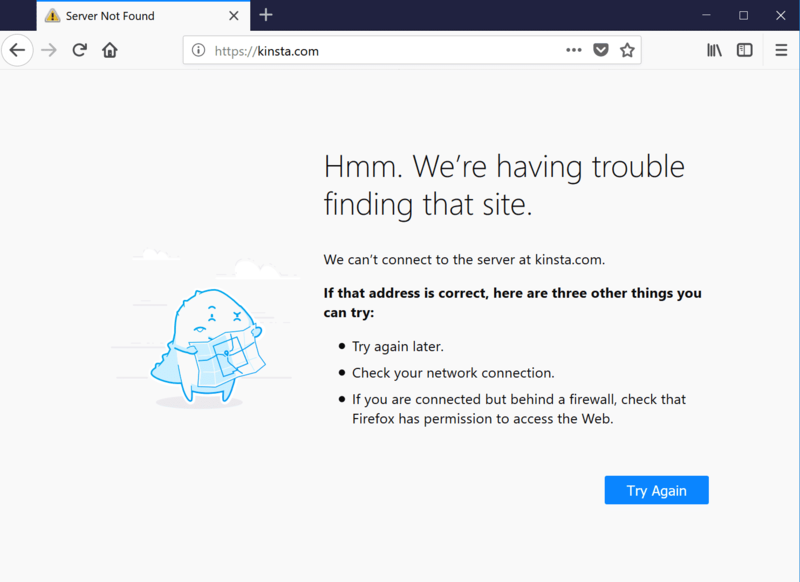 Between flushing your DNS cache, renewing your IP, and trying different DNS servers, you should hopefully be back up and surfing the web in no time. If we missed anything, feel free to let us know below in the feedback section.